Studies show that although Americans grapple with the terms "pro-life" and "pro-choice," most voters consistently support a woman's right to an abortion. We saw this play out in real time during last year's elections: remember the Gallup poll which found that only 41% of people identified as pro-choice? 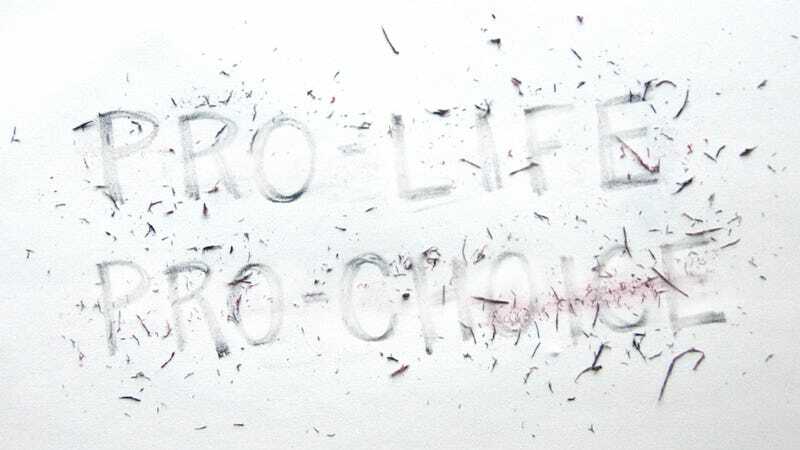 Conservatives wouldn't shut up about what that meant for Americans (read: embryos) — until abortion rights supporters voted in droves on November 6th and proved that "pro-life" doesn't necessarily mean "pro-politicians-making-choices-for-women." Now, after exhaustive research, Planned Parenthood is abandoning the limiting and confusing terms "pro-life" and "pro-choice" in hopes of reaching more women who don't identify as "pro-choice" but still support and need their services. When Planned Parenthood polled Americans to figure out how they felt about the labels, the results were confusing, because people found the labels confusing: for example, in one 2012 poll, 35% of voters who identified as pro-life also said they didn't think Roe v. Wade should be overturned. In another, 12% of online survey takers said they were both pro-life and pro-choice, while another 12% didn't want to use those terms, and 40% said "it depends on the situation" when asked about their moral opinions on abortion. "There should be three: pro–life, pro-choice and something in the middle that helps people understand circumstances…it's not just black or white, there's grey," one woman who identified as pro-life told Planned Parenthood. The organization is hoping that they can connect with women just like her by dropping the terminology, which has really only ever adequately served the purposes of the anti-abortion advocates who originally coined the term — few people are actually "anti-life," after all. That's why we try to avoid using the term "pro-life" on Jezebel, along with a growing number of left-leaning outlets. The terms become even more meaningless when Republicans claim how "pro-life" they are while also opposing gun control and making fun of people who take global warming seriously. What does it mean to be "pro-life" if you're okay with fully-formed humans dying in gun massacres and hurricanes? Those politicians aren't in favor of all life, just "innocent" lives that don't yet exist — made-up lives that don't need education reform or health care or other complicated but crucial initiatives. "Pro-choice" isn't as misleading, but it doesn't have the same strong ring to it as "pro-life," either. Planned Parenthood Executive Vice President Dawn Laguens spoke about the problematic use of "choice" at a press briefing Wednesday, explaining how women once had way fewer choices than they do today. Now, she said, maybe "'choice' as word sounds frivolous." "It's an opportunity to talk to an enormous number of people we haven't been talking to as much as we should," said Planned Parenthood president Cecile Richards, who was also in attendance to help introduce the organization's upcoming advertising campaign, which will highlight how complex and personal the decision to have an abortion can be with taglines such as "Only you know what it's like to walk in your shoes" and "Decisions about reproductive health are personal. You can help keep them that way." The 2012 election proved that most Americans want women, not politicians, to make their own decisions about their reproductive health. Let's follow Planned Parenthood's example and stop making it easier for anti-abortionists to pretend they're really interested in "saving lives" or "the health of the mother" when they're really concerned with passing laws that limit the reproductive rights voters clearly support.